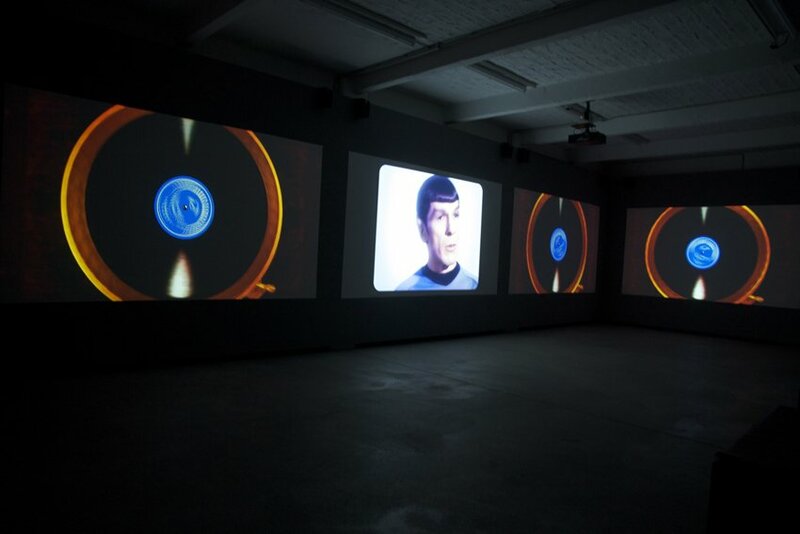 Astro Black (2007 - ongoing) is an episodic video cycle informed by Afrofuturism – a field of theory that examines the intersection of science fiction and social politics in Black Atlantic culture. Taking the cosmic musician Sun Ra as a point of departure, Astro Black seeks to draw out the conceptual implications of Sun Ra's intergalactic musical politics and the profound impact of his legacy. This sonic fiction activates a form of radical historiography where official accounts of the past are willfully reconfigured to open new and hopeful futures. 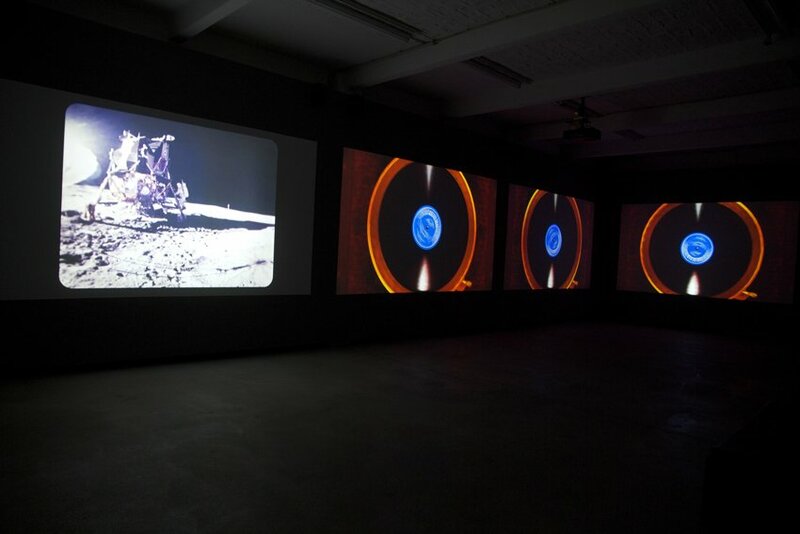 The episodic history of Astro Black takes the form of an ever-expanding series of 4-channel video installations, the first of which was completed in 2010. By engineering connections between Sun Ra's account of alien abduction and the 1969 moon landing, Episode -1 reflects on the cultural politics implicit in the colonisation of outer space as both a geography and virtual field of possibility. While playing piano in Chicago in 1943, Sun Ra is contacted by Morpheus who offers him a choice of two destinies. Episode -1 then flashes forward to Neil Armstrong stepping onto the lunar surface, only to discover that the moon is already inhabited by Sun Ra and his cosmic band The Arkestra. Set in the 70s, Episode 0 traces the impact of German electronic music on the Afrofuturist sonic cultures of hip-hop and techno. It is narratively structured around the film Close Encounters of the Third Kind (1977) where scientists use a synthesizer keyboard to communicate with an alien mothership. In this episode Kraftwerk instead play sequences from their own music, prompting Sun Ra's mothership to respond with audio tracks that have sampled Kraftwerk. This jam session – between the original and sampled versions of Kraftwerk’s music – points towards conceptions of cultural production that unsettle the limiting framework of nationalism. Early hip-hop culture was heavily influenced by the intergalactic mythologies of Sun Ra and George Clinton, and Episode 1 seeks to draw out these connections. Set in 1974 in the South Bronx, the episode begins in a neighbourhood centre where Sun Ra is discussing his ideas about the intersection of myth, race and outer space. It is here that the three future originators of hip-hop – Kool Herc, Afrika Bambaataa and Grandmaster Flash – are abducted and transported across the galaxy to Planet Rock where they are schooled in the alien language of turntablism. Episode 2 examines the shift in the 1980s from the party-music roots of early hip-hop to the overtly politicized work of artists such as Public Enemy. Instead of invoking the promise of an alternate future, Public Enemy mobilizes science fiction to frame the present in a state of critical emergency. Following the archeological discovery of an ancient stone crosshairs (the P.E logo), the episode cuts to 1988 and the arrival of an ominous mothership in New York City. By hijacking President Ronald Reagan's TV broadcast, the mothership transmits an alternative statement from Chuck D and Sun Ra that incites viewers to take to the streets and fight the power. Soda_Jerk, Astro Black, 4-channel video installation, Künstlerhaus Bethanien, Berlin, 24 March - 17 April, 2011. Photo by The Registry.